Working with Rochester Oyster and Floating Fishery, Kent and Essex Inshore Fisheries and Conservation Authority (IFCA) is leading the way in marine conservation with the creation of the UK’s largest no-take zone in the Medway Estuary. The no-take zone covers 12.1 square kilometres (4.6 square miles) of saltmarsh and mudflat environments that are vitally important to a wide variety of fish. The shallow waters have been identified as a nursery area, as they provide a refuge for fish during their juvenile stages, allowing them to shelter from predators and storms whilst supporting an abundance of prey sources. 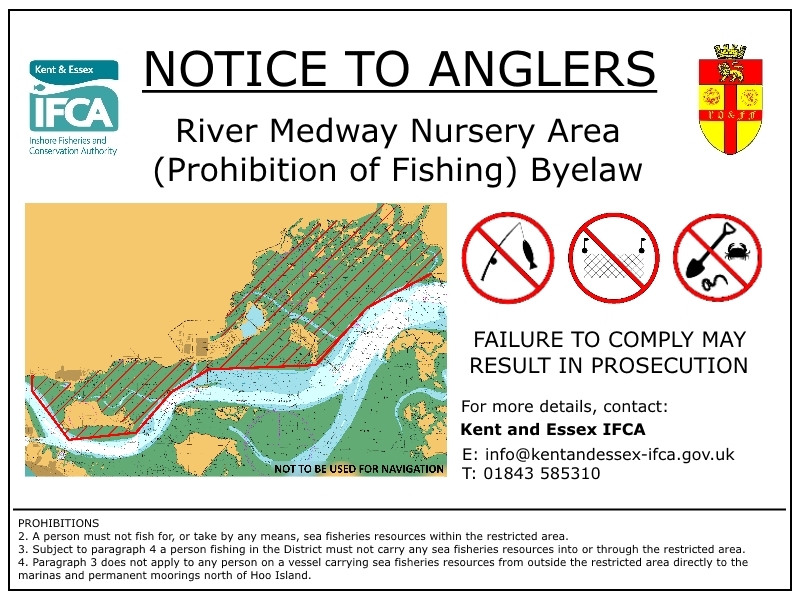 The River Medway Nursery Area No-Take Zone byelaw prohibits any fishing activity within the intertidal areas along the northern banks of the estuary, spanning from Hoo Marina to Elphinstone Point. This includes angling and netting from boat or shore, and bait digging. Anyone caught fishing within the restricted area may be liable for prosecution. This entry was posted in Environment, Wildlife by admiral. Bookmark the permalink.